Silver Past Master's Jewel suspended from a sky blue ribbon by two silver bars. and a crown above the name, with two shamrocks either side. The bottom bar has the number of the Lodge "Masonic Lodge 290". The Compass and Square is a standard silver Past Master's Jewel with a fixed "G". Short History of Warrant No. 290. Officer of the 39th Regiment of Foot c. 1754. Warrant No. 290 originally issued to the 39th REGIMENT of FOOT on the 5th January, 1758. Warrant No. 290 became settled in CASTLETOWN, Isle of Man, in or about 1785 and was Cancelled on the 7th October, 1813. Warrant No. 290 reissued to brethren in KELLS, Ballymena, County Antrim on the 24th June, 1821 and was Cancelled on the 7th September, 1843. Warrant No. 290 reissued to `St. Leonard’s Lodge’, SYDNEY, New South Wales, Australia on 18th July, 1867 and was removed from the printed Report in 1886. History of Deramore Lodge No. 290, 1900 - to date. "5 June, 1900 – Read Memorial from Bros. Morton, Hamilton, Childs and eight others for a Warrant to establish a Lodge in Rosetta, Co. Down, to be called the “Deramore”. Recommended by Lodges 108, 481 and 61 and the P.G.M. of Down." The Recommendation of The Board was followed, as is shown in the Grand Lodge Minutes of 7th June, 1900 as "Confirmed". Warrant No. 290 reissued to Richard Morton (Lodge 186) as W.M., William Houston (Lodge 685) as S.W., and William J. Childs (Lodge 133) as J.W.,to form `Deramore Lodge' in ROSETTA, BELFAST on the 7th June, 1900. A further five brethren registered up to 21st November, 1900. In all cases the dates when the degrees were conferred and the issue of certificates is shown. A Special Communication of the P.G.L. of Down held in Rosetta Masonic Hall, Ballynafeigh on Saturday, the 23rd June, 1900 to Constitute Deramore Lodge No. 290. The Lodge was opened on the First Degree at 12.30 p.m. The Provincial Grand Lodge had been specially summoned for the purpose of Constituting “Deramore” Masonic Lodge, No. 290, the ceremony was performed according to ancient Masonic custom by V.W. Bro. Jonathan Jefferson, who presided in the unavoidable absence of the R.W. the P.G.M. The Lodge then closed in Peace, Love and Harmony after which the P.G. Officers, and a large number of Visiting Brethren, were most hospitably entertained by the members of the new Lodge. Other Founders included Bros. John Skillen, P.M.; Henry Russell; J. Forde; H. Mateer; J. Mateer and James M. Beattie. There is no entry for the 1914 -18 War. "4 March, 1918 – Change of place of meeting - Approved"
Irish Masonic Records [Philip Crossle] shows [Deramore Lodge No. 290] - "Removed to Freemasons’ Hall, BALLYMACARRET, BELFAST, 1918." Series four Vol. 14 of the extant Grand Lodge Registers shows a list of 13 brethren clearly transcribed, including their occupations, from the previous volume and a total of 148 brethren registered up to 23rd October, 1923. In most cases the dates when the issue of certificates is shown, together with the occupation of the brother. Series five Vol. 19 shown as Vol. 3 of the extant Grand Lodge Register commences with the registration George Howden, S. Constable RUC, registered 25th March, 1924. A total of 103 brethren registered up to 27th May, 1952. In most cases the dates when the issue of certificates is shown, together with the occupation of the brother. Series six Vol. 21 of the extant Grand Lodge Register commences with the registration of W. J. E., Overseer, registered 28th April, 1953. A total of 84 brethren registered up to 25th October, 1983. In most cases the dates when the issue of certificates is shown, together with the occupation of the brother. From 1984 the registration of Deramore Lodge No. 290 members is held, in alphabetical order, in a computerised register by Grand Lodge, Freemasons’ Hall, 17 Molesworth Street, Dublin 2. The Registration of the Worshipful Master, Wardens and Secretary of Lodges are held in separate Registers, the first Volume covering the period 1983 to 1994 inclusive and the second Volume covering from 1995 to date. Permission was granted form both Provisional Grand Lodge of Down and the Grand Lodge of Ireland. The Warrant was moved to The Mount Masonic Centre, Park Avenue, Belfast, on the 1st January, 2006 where the Lodge resumed its normal meeting times and dates. The Deramore Lodge Crest by W.Bro. Alan Gilfillan, P.M. The material in this document is drawn from an unusually large number of sources, including family history records, Lodge Minutes, internet and personal correspondence. Unfortunately due to the lack of any written information and the passage of some one hundred and four years, all information to do with our Lodge crest had been lost. We know from our Lodge history sheets who named us Deramore but as to why the name Deramore was chosen and our association to the name is as yet unknown… the following account represents the Story of our Lodge crest as accurately as I have been able to establish it. The Batesons or Deramores, as they become known after taking the title in 1885, lived at Belvoir until the latter years of the 19th century, they came to Ulster from Yorkshire. One branch of the family established itself at Orangefield in the early 18th Century. Thomas Bateson, father of Robert who became the owner of the Belvoir Estates, died at Orangefield in 1811. Robert Bateson, founder of the House of Deramore, was born in 1782 and died in 1863. He was created a Baronet in 1818. His eldest son Robert, was an MP for County Londonderry and died in Jerusalem, aged 27. On 24th December, 1847. His second son Thomas, was born on 4th June, 1819. 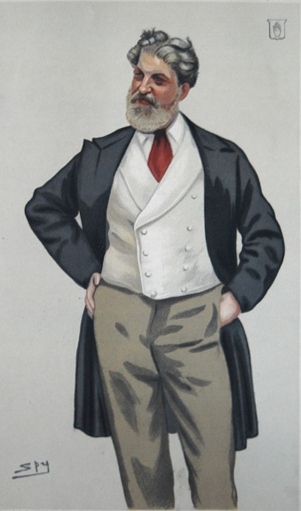 He was raised to the peerage as Baron Deramore in 1885 and after 34 years of service in Parliament died on 1st December, 1890. Baron Deramore of Belvoir in the County of Down, was a title in the Peerage of the United Kingdom. It was created on 18th November, 1885 for the Conservative Member of Parliament Sir Thomas Bateson, 2nd Baronet. His father Thomas Bateson had been created a Baronet, of Belvoir Park in the County of Down, on 18th December, 1818 in the Baronetage of the United Kingdom. The Barony was created with special remainder to the first Baron's younger brother George, who succeeded him as second Baron. He was the husband of Mary Elizabeth de Yarburgh (died 1884), daughter and heiress of George John de Yarburgh, of Heslington Hall in Yorkshire, and assumed in 1876 by Royal license the additional surname of de Yarburgh. In 1892 Lord Deramore assumed the surname of Bateson after, instead of before that of de Yarburgh. He was succeeded by his son, the third Baron. He served as Lord-Lieutenant of the East Riding of Yorkshire from 1924 to 1936. On his death the titles passed to his younger brother, the fourth Baron. The titles became extinct on the death of his younger son, the sixth Baron (who had succeeded his elder brother), in 2006. 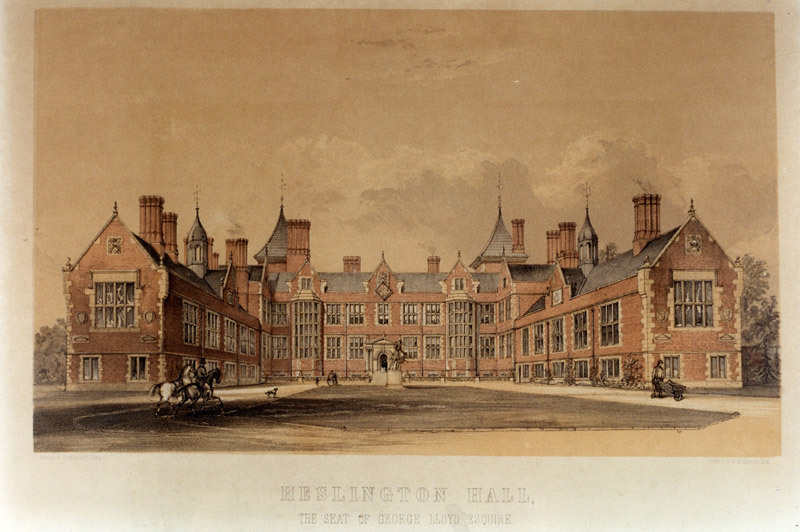 The former family seat was Heslington Hall, near York, which was acquired by the University of York in 1962 and now forms part of its campus. The Hall was lived in by the family of the Barons Deramore until c. 1940. There is a plaque in Moira Parish Church to Sir Robert Bateson and also a family vault is under the obelisk in the Churchyard. Incidentally there is also a plaque to the first Lady Deramore in Moira Parish Church, and an identical plaque is also found in Knockbreda Parish Church in Belfast with which the family were also connected. The present Lord Deramore is Arthur de Yarburgh-Bateson. Comparison of Deramore Lodge Crest with the de Yarburgh-Bateson Family Crest. ARMS:..Quarterly, 1st and 4th, per pale Argent (silver) and Azure (blue), a chevron between three chaplets counterchanged and for distinction, a cross crosslet in the centre chief point counterchanged. For YARBURGH; 2nd and 3rd, Argent (silver), three bats wings Sable (black), on a chief Gules (red), a lion passant Or (gold), for BATESON. CRESTS:..1st - A falcon close or (gold), belled gold, preying upon a duck proper (natural colour) and for distinction, the falcon charged on the breast with a cross crosslet Azure (blue), for YARBURGH; 2nd - A bat's wing Sable (black), for BATESON. Comparison of Deramore Lodge Crest with the de Yarburgh Family Crest. The Yarbrough crest has on the top of the helmet ( a golden falcon ), which is belled (closed wings). The falcon also has bells on its legs and is preying, or more correctly 'trussing', on a mallard 'proper'. This means its colour is natural. The helm, which sits atop the crest, is shown in profile with the visor closed. This indicates that the family were warriors. The seam where the helm meets the torse is covered with a silk scarf that has 6 twists in it. The shield itself is pale argent (silver) and azure (blue), with a chevron between three chaplets counterchallenged. The mantling is sable and argent. Beneath this is the family motto--Nocte Volamus (Who dares wins).... also the Motto of the S.A.S. Comparison of Deramore Lodge Crest with the de Bateson Family Crest. BATESON … Possibly a modern form of the ancient Irish name "MacPartholain". The Bateson crest has 2nd and 3rd, Argent (silver), three ( bats wings ) Sable (black), on a chief Gules (red), a lion passant Or (gold), for BATESON. Deramore Masonic Lodge No 290 crest is the de Yarburgh-Bateson family crest, which is the family name of Lord Deramore. If we dissect the Lodge crest it is easy to see the make–up of the crest…The Yarburgh Falcon and The Bat wing of the Batesons. Details of when Deramore Lodge No. 290 meets. 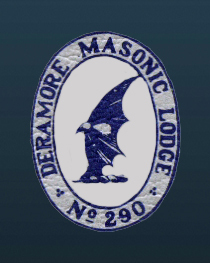 Deramore lodge no. 290 meets on the 4th Tues. at 7.30p.m. (Except 6, 7 & 8) at The Mount Masonic Centre, 45 Park Avenue, Belfast BT4 1PU, County Down. following "link" ~ Deramore Lodge No. 290.